Once you’re inside our impressive showroom, you’ll find a team of 4 with more than 60 years in the industry between us. We know our products inside out and are always happy to help with advice and tips. We’ve created a kids’ area so that anyone with children in tow can still take their time over important decisions; and with the usual huge Brewers range of paints, assorted decorating sundries and more than 240 wallpaper pattern books there’s certainly enough to choose from. That said – if we don’t carry it in stock, we can usually order whatever you need directly into store within a few days. 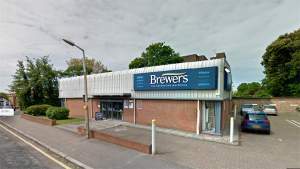 The Margate Brewers Decorator Centre has been serving the town for more than 40 years. We’re on Clarendon Road, just off Northdown Road in the Cliftonville area. Take the junction with Cooke & Co estate agents and the One Stop convenience store and we’re 100 yards down on the right. It’s a rather handy spot, well away from the out-of-town shopping areas, so there’s less traffic to slow you up when you just want to get on with the job. We have excellent parking facilities too. If you are coming off Wilderness hill right onto Clarendon Road from Dane Park direction, follow the road all the way around to the left to find the store on the left.